The first concept to understand before embarking on this tutorial is the definition of the term fatigue within the confines of this guide. Very often the terms Fatigue, Fracture, and Durability are used interchangeably. Each does, however, convey a specific meaning. Although many definitions can be applied to the word, for the purposes of this manual, fatigue is failure under a repeated or otherwise varying load which never reaches a level sufficient to cause failure in a single application. It can also be thought of as the initiation and growth of a crack, or growth from a pre-existing defect, until it reaches a critical size, such as separation into two or more parts. Fatigue analysis itself usually refers to one of two methodologies: either the Stress-Life (S-N) or S-N method, commonly referred to as Total Life since it makes no distinction between initiating or growing a crack, or the Local Strain or Strain-Life (e-N) method, commonly referred to as the Crack Initiation method which concerns itself only with the initiation of a crack. Fracture specifically concerns itself with the growth or propagation of a crack once it has initiated. MSC Nastran fatigue analysis concerns itself only with the prior two types of fatigue analysis and is not applicable for crack growth or propagation. For this capability you are referred to MSC Nastran’s cohesive zone modeling and/or virtual crack closure technique (VCCT) or MSC Fatigue, which uses a LEFM method for crack growth prediction. Durability is then the conglomeration of all aspects that affect the life of a product and usually involves much more than just fatigue and fracture, but also loading conditions, environmental concerns, material characterizations, and testing simulations, to name a few. A true product durability program in an organization takes all of these aspects (and more) into consideration. Note: Fatigue cracks initiate and grow as a result of cyclic plastic deformation. Without plasticity there can be no fatigue failure. All attempts are made in this guide to explain how plasticity is taken into account when determining fatigue life from linear elastic finite element analysis. These fatigue analysis example exercises are constructed around the concept of the fatigue “five-box trick.” The illustration below depicts this well. For any life analysis whether it be fatigue or fracture there are always three inputs. The first three boxes are the inputs; box four the analysis; and box five the results. Cyclic Material Information: Materials behave differently when they are subject to cyclic as opposed to monotonic loading. Monotonic Properties are the result of material tests where the load is steadily increased until the test coupon breaks. Cyclic Properties are obtained from material tests where the loading is reversed and cycled until failure at various load levels. These parameters differ depending on the fatigue analysis type involved. Service Loading Information: The proper specification of the variation of the loading is extremely important to achieve an accurate fatigue life prediction. The loading can be defined in various manners. Whether it be time based, frequency based, or in the form of some sort of spectra depends on the fatigue analysis type to be used. When working with finite element models the loading can be force, pressure, temperature, displacement, or a number of other types. Loading in the test world usually refers to the acquisition of a response measurement, usually from a strain gauge. Geometry Information: Geometry has different meanings depending on whether you are working from a finite element model or from a test specimen. In the testing world, the geometry input is the Kt (stress concentration factor) since the point of failure is usually away from the actual point of measurement. Therefore a geometry Stress Concentration Factor, Kt, is defined to relate the measured response to that at the failure location. You can think of this as a fudge factor. The corresponding role of finite elements is to produce fields of Kt over the entire model, with the additional complication that these local stress concentration factors are in the form of stress tensors. Analysis: The correctness and accuracy of each of the above inputs is important in that any error in any of these will be magnified through the fatigue analysis procedure, the fourth box, since this process is logarithmic. A ten percent error in loading magnitude could result in a 100% error in the predicted fatigue life. In a conventional finite element based fatigue analysis, the 4th box often contains both the stress prediction and fatigue life calculation. Results: The fifth box is the postprocessing or results evaluation. This can take on the form of color contours on a finite element model or a tabular listing but also quite often leads back into the three inputs to see what effect variations of these inputs will have on the life prediction. This is referred to as a sensitivity or a “what if” study. This is extremely useful at times when you are not quite sure about the accuracy of one of the inputs. This then leads to design optimization using fatigue life as a design constraint or possibly even as a design objective. There are three main life prediction methods as already mentioned earlier. These are Total Life, Crack Initiation, and Crack Growth (Propagation). Total life is aptly named in that only the total life of the component is of concern and not when a crack will initiate or how quickly it will grow. The three methods are related to each other by the fact that the total number of cycles to failure, Nf, equals the number of cycles to initiate a crack, Ni, plus the number of cycles to propagate that crack, Np. The three methods have grown out of different needs over the decades using different techniques and having different degrees of accuracy. So in theory this equation is true, but in practice when applying the three methods to the same problem, rarely, if ever does it add up. In reality however, rarely are all three methods used on the same problem, mainly because different industries adopt different analysis methods depending on the driving design philosophy. See Design Philosophies, 8. In order to do life predictions, MSC Nastran embedded fatigue analysis supports use of stress-life and strain-life methods using the stress/strain response results from different finite element (FE) analysis techniques. The table below summarizes which FE analysis types are applicable to which life prediction methods in this release of the software. There are three main fatigue design philosophies. Each centers around one of the fatigue life estimation methodologies. To illustrate the three consider the design of a stool. The Safe Life philosophy is a philosophy adopted by many, but especially the ground vehicle industry. Products are designed to survive a specific design life. Full scale tests are usually carried out with margins of safety applied. 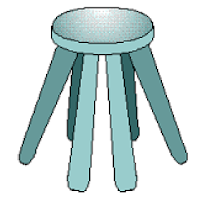 In general, this philosophy results in fairly optimized structures such as a stool with three legs. Any less than three legs and it would fall over. This philosophy adopts the crack initiation method and is used on parts and components that are relatively easy and inexpensive to replace and not life threatening if failure were to occur. Most of the life is taken up in the initiation of a crack. The propagation of that crack is very rapid and short in comparison. On the other end of the spectrum of design philosophies is that of Fail Safe. This is where a failure must be avoided at all costs. And if the structure were to fail it must fall into a state such that it would survive until repairs could be made. 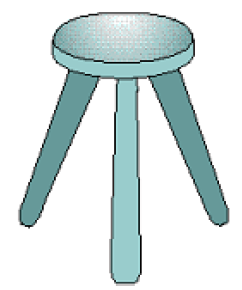 This is illustrated with our stool now having six legs. 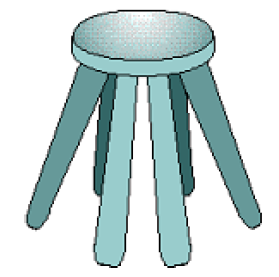 If one leg were to fail, the stool would remain standing until repairs could be made. This philosophy is heavily used in safety critical items such as in the aerospace or offshore industries. The middle ground philosophy is that of Damage Tolerant. This philosophy, adopted heavily in the aerospace community and nuclear power generation, relies on the assumption that a flaw already exists and that a periodic inspection schedule will be set up to ensure that the crack does not propagate to a critical state between inspection periods. As implied, this philosophy adopts the crack growth method. 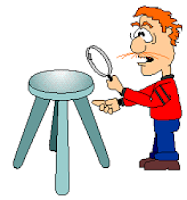 This is illustrated using our stool (now with four legs) and with someone inspecting it occasionally. This particular design philosophy is generally used in conjunction with the fail safe philosophy, first to design for no failure. and then to assume that, for whatever reason, a flaw exists and must be monitored. MSC Nastran’s cohesive zone and virtual crack closure technique (VCCT) modeling capabilities or some other fracture mechanics technique such as MSC Fatigue (LEFM based) are best suited for this damage tolerant design philosophy and are not covered topics of this manual. Fail safe and safe life philosophies using the S-N and ε-N methods are the topics covered by this manual. The life estimation process really centers around two major relationships. The first relation is that of the loading environment to the stresses and strains in the component or model. This load-strain or load-stress relation is determined using finite element modeling and running linear elastic FE analysis. It is dependent on the characterization of the material properties and in some instances requires that a Notch Correction procedure take place. For the purposes of this discussion a notch correction is simply a way to compensate for plasticity from a linear FE analysis. The second relation is that of the stresses or stains to the life of the component or model. This is accomplished by using damage modeling. Each fatigue life method has its own techniques to determine and sum damage which shall be explained as you progress through the example problems. Of the three fatigue methods used to predict life, it is important to understand when to use which. This will become more evident as you proceed through this manual and work each exercise. As a quick answer to this question, the following guidelines are presented. Components which are required by a control body to be designed for fatigue using standard data such as MIL handbook data. The majority of this content was directly cited from page 1 of the MSC Nastran 2013 Nastran Embedded Fatigue User’s Guide. Relevant engineering software: MSC Nastran for FEA and fatigue analysis, and MSC Fatigue for fatigue analysis.